Girls who once dreamed of being their favorite pop star brought the fantasy and fun to life in 2001 when they took center stage with e-kara Real Karaoke from Hasbro. The portable and affordable hand-held karaoke system, first introduced in the U.S. in October, was a ‘must have' among ‘tweens' and teens, making e-kara one of the most sought after toys of the year. 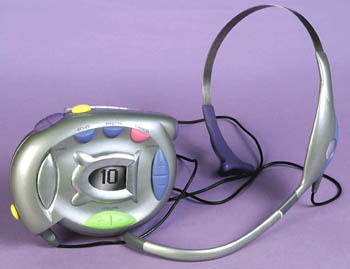 The party continues in 2002 with the introduction of a new hands-free headset system and a library of music cartridges featuring some of the hottest songs hitting the airwaves. The success of U.S. launch of Ekara Real Karaoke Headset E-Kara Duet spawns new headset system and library of cartridges. "Music has become an integral part of toys that are geared towards older, more elusive kids," says Jim Silver, co-publisher of Toy Wishes Magazine. "Its no surprise that e-kara had such a strong first year. Hasbro found success with Hit Clips and now with e-kara," Silver says. "E-kara definitely has the staying power to become a staple within the Hasbro portfolio."